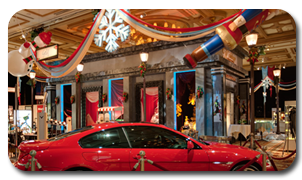 When you're decorating for a casino/hotel of the highest caliber, you pull out all the stops. That's why the MGM Mirage decided inflatable advertising balloons would be the perfect addition to the Players Club Holiday Gift Shoppe located on site. Stretching 10-feet tall, the snowman and toy soldier made a huge impression and spread holiday cheer to all who attended the event. Looking for a way to evoke the WOW factor and incorporate lots of fun into the occasion, the hotel/casino chose a Macy's Thanksgiving Day Parade theme. Creating a New York City streetscape meant the inclusion of certain traditional icons. The snowman and toy soldier inflatable characters were must-haves to complete the scene. Hanging high overhead and adorned with streamers, these beloved holiday characters brought smiles to all who passed by. Throughout the year, Players Club members collect points when they play slots at participating casinos. Then, at an elaborate year-end event, points can be used to purchase "watches, jewelry, electronics, home & sporting goods, gift cards, free play and more," according to the Players Club website. This most recent Gift Shoppe event was an occasion to remember and certainly set the bar for years to come.